It is spring in the Norwegian capital. 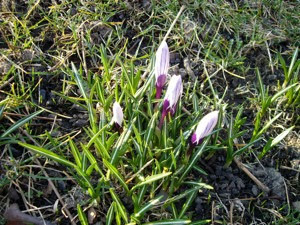 These croci are budding in the yards of the old University as the first signs of spring. This time of the year is probably the most beautiful of seasons in Scandinavia. Past spring equinox, as the days grow longer and longer daylight reaching its peak at St. Hans Aften (Saint John's Eve) third week of June - also known as Summer Solstice. Yesterday I brought my camera around in town, on my way to work and on my way to a meeting. Let me give you some snapshots from the Norwegian capital during these beautiful days of late March.